Software from RP Photonics - At which Wavelength will a Laser Emit? At which Wavelength will a Laser Emit? Abstract: It is explained what physically determines the emission wavelength of a laser with a broadband gain medium, and how one can most efficiently calculate the emission wavelength with a numerical model. Although in some cases it is quite obvious at which wavelength a laser will emit, there are others where a laser with large gain bandwidth or with multiple emission lines may go for different wavelengths, depending on the circumstances. Here, I will discuss two questions in this context: what exactly determines the laser wavelength physically, and how can we find it in a numerical model? We restrict the discussion to continuous-wave lasers; for Q-switched lasers, for example, some aspects are different. It is sometimes said that the laser will lase where the gain medium products the highest gain. That cannot be true, of course, where the resonator losses are substantially wavelength-dependent. So the criterion should be based on the net gain, i.e., the gain minus the losses (both measured in decibels). This is still not the full truth. For quasi-three-level gain media (the normal situation for fiber lasers), the shape of the gain spectrum depends on the excitation level. So for what excitation level should we calculate the gain? A good way to understand the matter is to imagine that the pump power is slowly increased until lasing begins. That will happen as soon as the net gain exceeds 0 dB at some wavelength. The laser wave should then sooner or later saturate the gain such that the net gain stays exactly at 0 dB, because otherwise the laser power would continue to grow without any limit. That means that the excitation of laser-active ions will be “clamped” to its value at the laser threshold, and the spectral shape of the gain cannot change any more, even for a quasi-three-level gain medium. Well, that picture is actually a bit too simple in some cases. For example, we may have inhomogeneous gain saturation: the gain at other wavelengths can still rise for stronger pumping, so that lasing may start there as well. That can lead to broadband emission or to simultaneous emission on different laser lines. That case, by the way, is rather difficult to simulate, because one would have to consider different classes of ions; the main difficulty would be to get all the spectroscopic data for those. Some degree of inhomogeneous saturation may also result from spatial hole burning. That at least doesn't involve critical data, so it can be treated with some specialized model. Here, however, we restrict ourselves to the simpler cases with homogeneous gain saturation. So we now discuss how one could calculate the laser wavelength with a numerical model, for example made with the RP Fiber Power software. One approach would be to make a model containing many different possible laser waves with different wavelengths. (In RP Fiber Power, these would be called “optical channels”.) The software should then be able to calculate the steady-state where just one of these many channels is actually lasing, while the others stay below the threshold and thus do not produce any output power. That approach, however, has the disadvantage that for obtaining a high accuracy of the calculate laser wavelength, one would need to use laser channels with an accordingly fine wavelength spacing – possibly leading to an impractically large number of required optical channels. Another problem might be that the algorithm may have some numerical problems if some optical channels have extremely similar gains. Even if that converges fine (which it should normally do with RP Fiber Power), it might take a large number of numerical iterations, and each one takes time due to the many optical channels. Thus, the computation time would be relatively long. 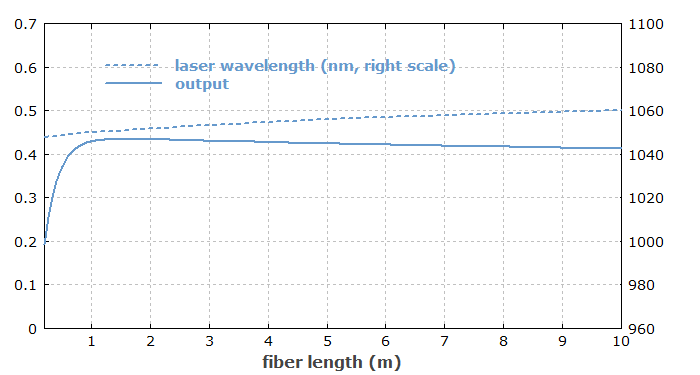 "laser wavelength (nm, right scale)"
color = red, width = 3, "residual pump"
color = blue, width = 3, "output"
Figure 1: Variation of the fiber length of an Yb-doped fiber laser. The longer the fiber, the longer is the emission wavelength. The output power drops if either the fiber becomes rather long, where the power losses by fluorescence get stronger, or the fiber is too short to efficiently absorb the pump radiation. The taken numerical approach is fairly efficient; the diagram above can be produced within 20 seconds on an ordinary office PC. This article is a posting of the RP Photonics Software News, authored by Dr. Rüdiger Paschotta. You may link to this page, because its location is permanent.